Disney Infinity’s Facebook page (along with other social media outlets) shared a teaser photo earlier today, hinting at Ant-Man being a character/figure for the upcoming sequel to its toys-to-life series. The game is set to release Aug. 30 in the United States and Disney has already announced several characters spanning Disney Originals, Marvel and, of course, Star Wars, which is the theme of the 3.0 edition of the series. Sony also announced at this year’s E3 that gamers who buy Disney Infinity 3.0 for PlayStation systems can purchase the Saga Bundle, which includes the Starter Pack, the Star Wars Rise Against the Empire play set and an early Boba Fett character, which will release for everyone at a later date. 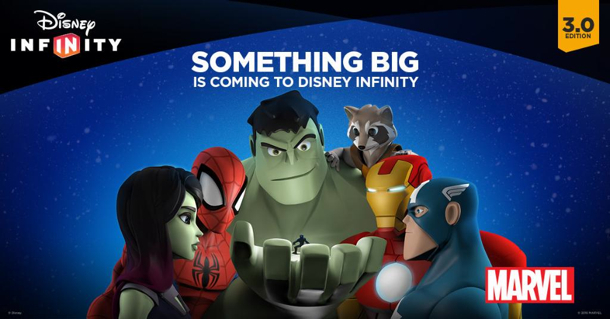 Disney’s teaser photo says something “big” is coming to Disney Infinity 3.0 and features Iron Man, Captain America, the Incredible Hulk, Rocket Raccoon and Gamora with Hulk holding a tiny figure in his hand. The assumption by the game’s community is that this is a tease for Ant-Man being announced as a character in the game. Given that the movie just released and that only two other Marvel characters (Hulkbuster Iron Man and Ultron) have been announced for 3.0, it would make sense that this is what Disney and Avalanche are teasing. We’ll update this article when we find out for sure.